Summer vacation from school is well underway. Keeping your kids occupied all summer can be a daunting task–especially on rainy days when going outside isn’t an option. Instead of popping in a movie, turn on your household printer! There are a ton of crafts you can do using your printer that will keep your kids busy and encourage creativity. We have put together a list of our favorites to get you started. 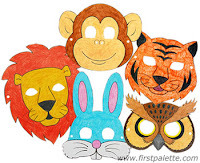 Printable puppets- Using these printouts, your kids can create their own puppets and put on their very own show. The print outs allow them to color their characters and then bring them to life by gluing them onto paper bags. Printed animal mask- Kids love to play pretend! Let them expand their imagination by printing out an animal mask for them. They can color and decorate the mask however they choose! When they are finished, help them cut out the mask, and attach an elastic string! Ta da! Coloring book pages- Sometimes it is just entertaining to sit around and color. Print your own coloring book pages to save on purchasing coloring books or to use when all of your coloring books have already been completed. There are a lot of sites online that allow you to print out coloring pages– some are even educational. Recycle old printed paper- Everyone prints something by accident or finds an error after printing every now and again. Instead of throwing the documents in the trash, save them to help entertain your kids. Try giving each child a sheet of the paper you mistakenly printed. Ask them to circle every letter “e” they can find on the paper. You can choose whatever letter you want or if they are old enough ask them to create words. This is a great activity for learning and a great way to recycle those printed pages. You can even let them cut up the papers and use them for art projects. Iron ons for t-shirts- This project requires a little more planning and a lot of help from an adult, but it is a project that the kids will love. Print out your own iron on patterns on your home printer. Afterwards, apply them to a t-shirt or some other form of fabric using your iron. Peel away the transfer paper and let the fabric cool. Afterwards, kids can color their own shirts using fabric markers! If you are looking for further ideas, try googling key phrases such as these: kids printer crafts, DIY printer projects for kids, printable projects for kids or childrens printer art projects. All of these search terms will provide you with a lot of choices for activities you do with your kids all involving your printer. Also check out our pinterest boards for more craft projects involving your home printer. What types of creative projects do you like to do with your kids? Do any of them involve your printer? We would love to hear your ideas! Your post is good. I like style of your writing. So I got pleasure reading it. Thanks a lot! hey that's really a great post and i like this and thanks for sharing it with us! Very interesting and original idea, you are the professional. I love these ideas! Especially about masks and printing out the board game - should be really interesting and creative! Kids are getting tired of old toys so fast so we need to get new ideas as much as possible and with this post you are really helping us out. Thank you.